(NCP). All available at Spectra Film and Video! For additional items, please inquire. You ask for it and we'll get it! manufacturers. Ask about our dealer discounts! listed to the right (not usable with regular 8). use with Hama Cinepress tapes listed to the right. Noris Splicomat and Wurker Super 8! cameras, cables or even actors. motion picture (film or digital) cameras! camera meters to expose film correctly. cotton swabs and microfiber cleaning cloth. buffs! Perfect centerpiece for any livingroom! Super 8 (filmmakers handbook) New! Magazine - Cheap! Latest or back issues! applications. Buy now and save 40% off news stand! $3.50 40% Off News Stand Price! products/services only available in Europe. 3.5" X 2.5" sheets per pack. provides a perfect width for sealing 35 and 16 cans. For writing on anything from leader to gaffers tape. edit points, A/B roll edits or sound sync points. work in nearly all super 8 cameras (except Beaulieu). cable. Includes wing grip with metal center lock. camera with a standard cable release socket. Kodak Presstapes listed to the right. them an excellent choice for archiving and storing film. (Elmo, Goko, etc.) with BA15S bayonet socket. etc) with standard BA15S bayonet socket. two 16mm spools or one 35mm spool (1200' ea). for tape splices only. Spectra's primary lab leader! Suitable for cement and tape splices. White Paper Tape - New Low Price! film. Easy to write on and will not leave residue. choice for the USC film program! remember for audio sync and picture start points. opening the film container or an x-ray is mandatory. surface with easy to remove crack-and-peel backing. use with 8mm roll tape listed to the right. $125.00 Most popular super 8 splicer! loaded (taped shut) and re-used again and again. Empty Super 8 Cartridge - Silicone Treated! Willard's Trichloroethane (Trike) Film Cleaner - The Real Deal! originally used in all ultrasonic cleaning machines. Take it from us, trike is the best film cleaner ever! Now, angry old Mr. Willard (retired lab tech) has bottled some up for sale from his dwindling stash! 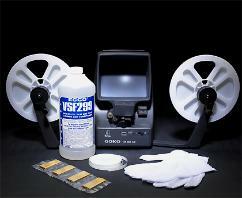 Safe for mag stripe film, microfilm, audio tape, old prints, slides, nitrate, acetate, polyester and more! Super 8 Today Magazine - Final Issue! levels - including an exclusive article on Spectra! custom lab rubber bands are the perfect replacements! for use with film. Includes pinch grip for easy removal. from the manufacturer and pass the savings to you! Need to guide film in a nonlinear path without scratching? bushings (not included) can be inserted to fit any shaft. film winding, editing, cleaning, scanning or developing. photo or computer paper prints. regular 8 and super 8 films. press plate removes air bubbles under tape. Hollywood Film or Ediquip splicers (as seen to the left). Kodak Made - Brand New! for years to come. Can and dark bag not included. chemically scrubbed for easy relabeling. scrubbed away for easy relabeling. music videos, art displays and much more. some in with your film for years of added protection. Super 8 Reel Adapter - New Low Price! buy these in bulk and pass the savings to you!